Recognized as one of the top play-by-play announcers in baseball, Bill Brown is informative, humorous and inspiring. And so is his new book. Its a must for every baseball fan, but its more than just a baseball book. Bill brings to life the stories of those who have inspired him, both personally and professionally, and he talks openly about his struggles to gain a foothold in the broadcasting business. All proceeds from the sale of Bills new book will benefit the National Foundation for Ectodermal Dysplasias, which provides support and assistance for individuals suffering from a debilitating disorder with no known cure. From Sedalia to Saigon, from the Big Red Machine to the Killer Bs and the 2012 season, Bill Brown charts every step of his baseball journey in the pages of this outstanding book. NON-SABR MEMBERS CAN MEET BILL ON THE FRONT STEPS OF OLD MAIN BEGINNING AT 1:30 P.M. Longtime Astros broadcaster Bill Brown isn't one to typically bring attention to himself, which makes him an unlikely candidate to write an autobiography. But after some encouragement from a colleague, and buoyed by the idea of being able to raise some money for charity, Brown put pen to paper. Brown, who's been behind the microphone for Astros games since 1987, detailed his early life and his career in the book "My Baseball Journey: A Sportscaster's Story," which was released in June. Brown co-wrote the book with Tim Gregg, a former sportscaster and public relations director on the women's tennis tour. "I've been thinking about doing an Astros history book, which I had been working on for three years, and that hit a dead spot," Brown said. Brown wanted to write a book to raise money for charity, and penned a 50-page book on the development of technology in sports broadcasting, which he admitted was a flop. "Nobody would have bought it and nobody would have read it," Brown said. 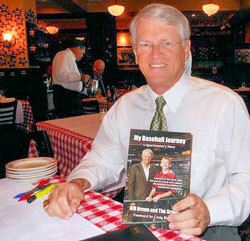 Houston Chronicle columnist Ken Hoffman sits down over lunch to talk about Astros sportscaster Bill Brown's new book. Astros broadcaster Bill Brown joined In The Loop with Nick and Lopez and discussed what to look forward to with the Astros, his thoughts on Carlos Lee and covering the Big Red Machine. 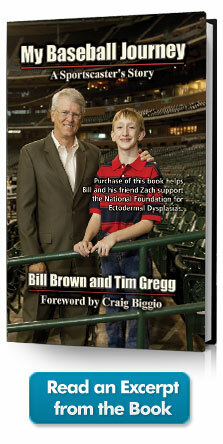 "If you want to read a great book and support a great cause, then check out Bill Brown's book. I've been working with him for 16 years and the man's a class act. He is even cool enough to include people like me in his story! Ha Ha. Really, it is a great book." "Insightful. Knowledgeable. Accurate. Bill Brown's storied career has put him in the enviable position of calling some of the greatest baseball plays of our time. He has seen the game as few others, and has painted the pictures for us so eloquently that fans feel that they are actually in the booth with him. He is a true professional."